Humanitarian organizations like the UN and Red Cross often face a deluge of social media data when disasters strike areas with a large digital footprint. This explains why my team and I have been working on AIDR (Artificial Intelligence for Disaster Response), a free and open source platform to automatically classify tweets in real-time. Given that the vast majority of the world’s population does not tweet, we’ve teamed up with UNICEF’s Innovation Team to extend our AIDR platform so users can also automatically classify streaming SMS. After the Haiti Earthquake in 2010, the main mobile network operator there (Digicel) offered to sent an SMS to each of their 1.4 million subscribers (at the time) to accelerate our disaster needs assessment efforts. We politely declined since we didn’t have any automated (or even semi-automated way) of analyzing incoming text messages. With AIDR, however, we should (theoretically) be able to classify some 1.8 million SMS’s (and tweets) per hour. Enabling humanitarian organizations to make sense of “Big Data” generated by affected communities is obviously key for two-way communication with said communities during disasters, hence our work at QCRI on “Computing for Good”. AIDR/SMS applications are certainly not limited to disaster response. In fact, we plan to pilot the AIDR/SMS platform for a public health project with our UNICEF partners in Zambia next month and with other partners in early 2015. While still experimental, I hope the platform will eventually be robust enough for use in response to major disasters; allowing humanitarian organizations to poll affected communities and to make sense of resulting needs in near real-time, for example. Millions of text messages could be automatically classified according to the Cluster System, for example, and the results communicated back to local communities via community radio stations, as described here. These are still very early days, of course, but I’m typically an eternal optimist, so I hope that our research and pilots do show promising results. Either way, we’ll be sure to share the full outcome of said pilots publicly so that others can benefit from our work and findings. In the meantime, if your organization is interested in piloting and learning with us, then feel free to get in touch. Aerial imagery will soon become a Big Data problem for humanitarian response—particularly oblique imagery. This was confirmed to me by a number of imagery experts in both the US (FEMA) and Europe (JRC). Aerial imagery taken at an angle is referred to as oblique imagery; compared to vertical imagery, which is taken by cameras pointing straight down (like satellite imagery). The team from Humanitarian OpenStreetMap (HOT) is already well equipped to make sense of vertical aerial imagery. They do this by microtasking the tracing of said imagery, as depicted below. So how do we rapidly analyze oblique images, which often provide more detail vis-a-vis infrastructure damage than vertical pictures? One approach is to microtask the tagging of oblique images. This was carried out very successfully after Hurricane Sandy (screenshot below). 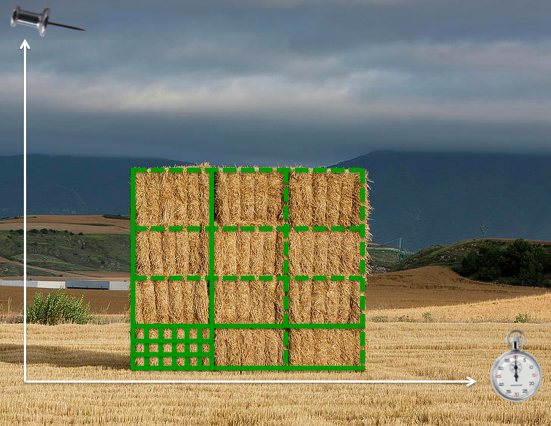 This solution did not include any tracing and was not designed to inform the development of machine learning classifiers to automatically identify features of interest, like damaged buildings, for example. 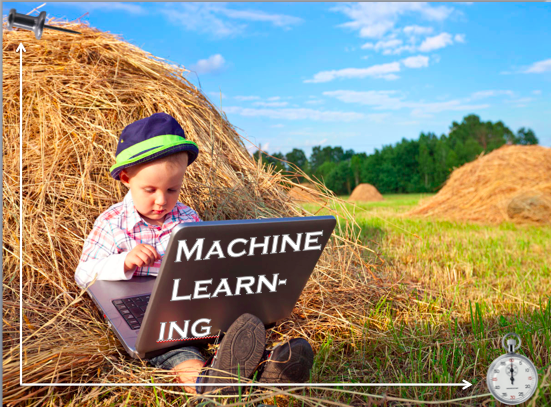 Making sense of Big (Aerial) Data will ultimately require the combined use of human computing (microtasking) and machine learning. As volunteers use microtasking to trace features of interest such as damaged buildings pictured in oblique aerial imagery, perhaps machine learning algorithms can learn to detect these features automatically if enough examples of damaged buildings are provided. There is obviously value in doing automated feature detection with vertical imagery as well. 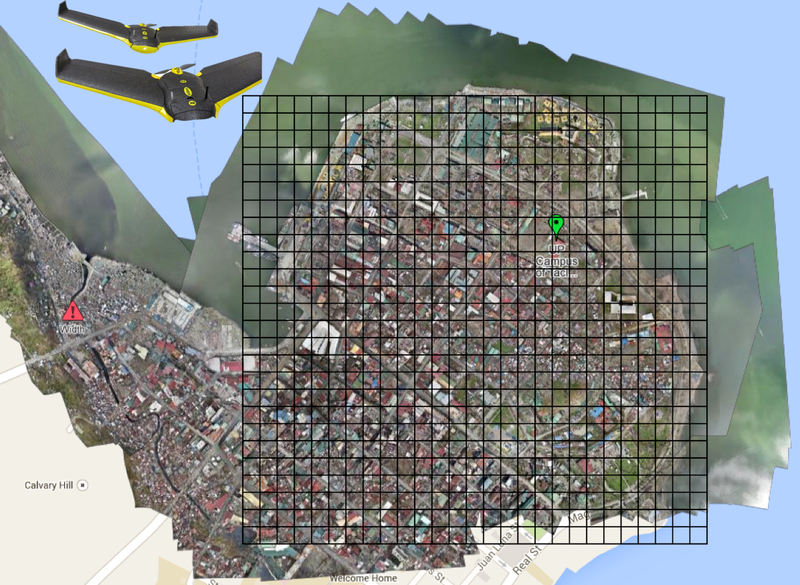 So my team and I at QCRI have been collaborating with a local Filipino UAV start-up (SkyEye) to develop a new “Clicker” for our MicroMappers collection. We’ll be testing the “Aerial Clicker” below with our Filipino partners this summer. Incidentally, SkyEye is on the Advisory Board of the Humanitarian UAV Network (UAViators). 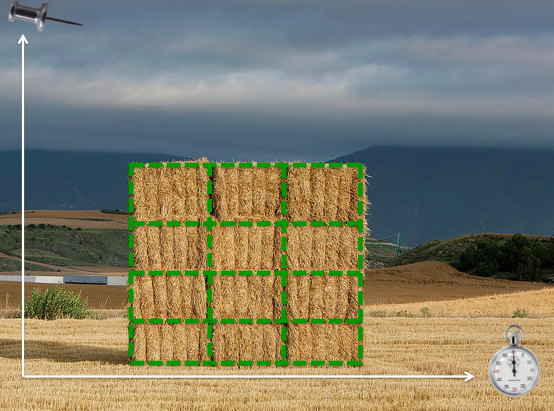 SkyEye is interested in developing a machine learning classifier to automatically identify coconut trees, for example. Why? Because coconut trees are an important source of livelihood for many Filipinos. Being able to rapidly identify trees that are still standing versus uprooted would enable SkyEye to quickly assess the impact of a Typhoon on local agriculture, which is important for food security & long-term recovery. So we hope to use the Aerial Clicker to microtask the tracing of coconut trees in order to significantly improve the accuracy of the machine learning classifier that SkyEye has already developed. Will this be successful? One way to find out is by experimenting. I realize that developing a “visual version” of AIDR is anything but trivial. 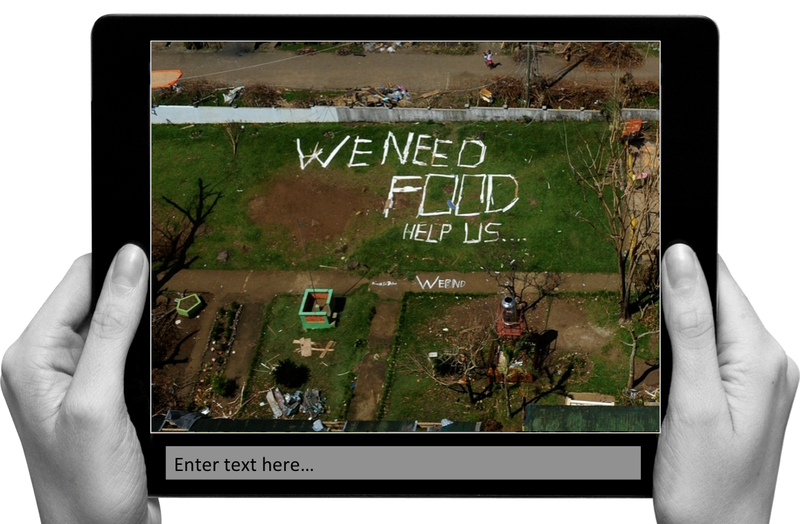 While AIDR was developed to automatically identify tweets (i.e., text) of interest during disasters by using microtasking and machine learning, what if we also had a free and open source platform to microtask and then automatically identify visual features of interest in both vertical and oblique imagery captured by UAVs? To be honest, I’m not sure how feasible this is vis-a-vis oblique imagery. As an imagery analyst at FEMA recently told me, this is still a research question for now. So I’m hoping to take this research on at QCRI but I do not want to duplicate any existing efforts in this space. So I would be grateful for feedback on this idea and any related research that iRevolution readers may recommend. I often see this in the aftermath of major disasters; affected communities turning to “analog social medial” to communicate when cell phone towers are down. 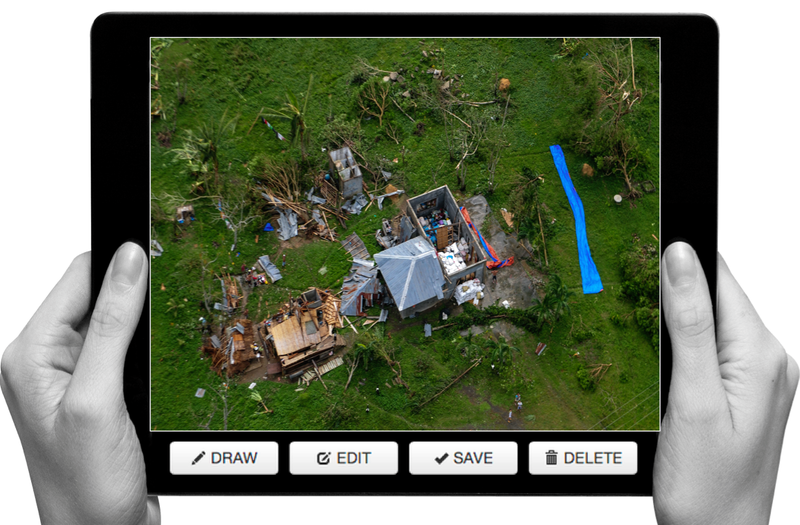 The aerial imagery above was taken following Typhoon Yolanda in the Philippines. And this is just one of several dozen images with analog media messages that I came across. So what if our Aerial Clicker were to ask digital volunteers to transcribe or categorize these messages? This would enable us to quickly create a crisis map of needs based on said content since every image is already geo-referenced. Thoughts? Disaster-affected communities are increasingly becoming “digital” communities. That is, they increasingly use mobile technology & social media to communicate during crises. I often refer to this user-generated content as Big (Crisis) Data. Humanitarian crisis computing seeks to rapidly identify informative, actionable and credible content in this growing stack of real-time information. 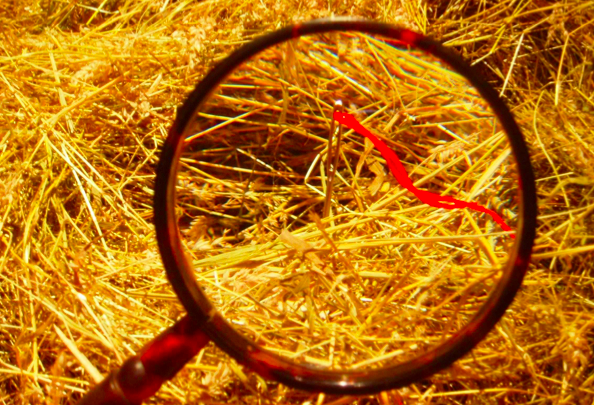 The challenge is akin to finding the proverbial needle in the haystack since the vast majority of reports posted on social media is often not relevant for humanitarian response. This is largely a result of the demand versus supply problem described here. In any event, the few “needles” of information that are relevant, can relay information that is vital and indeed-life saving for relief efforts—both traditional top-down efforts and more bottom-up grassroots efforts. When disaster strikes, we increasingly see social media traffic explode. We know there are important “pins” of relevant information hidden in this growing stack of information but how do we find them in real-time? Humanitarian organizations are ill-equipped to managing the deluge of Big Crisis Data. They tend to sift through the stack of information manually, which means they aren’t able to process more than a small volume of information. This is represented by the dotted green line in the picture below. 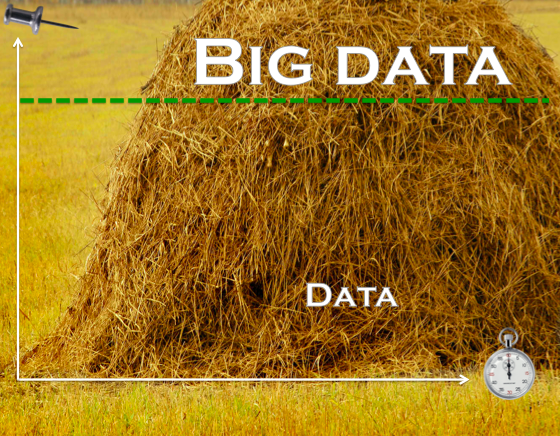 Big Data is often described as filter failure. Our manual filters cannot manage the large volume, velocity and variety of information posted on social media during disasters. 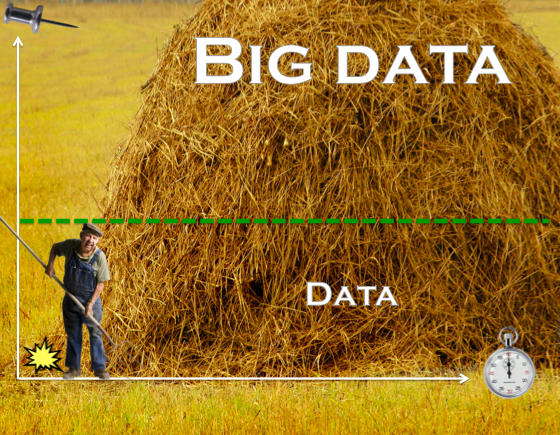 So all the information above the dotted line, Big Data, is completely ignored. This is where Advanced Computing comes in. 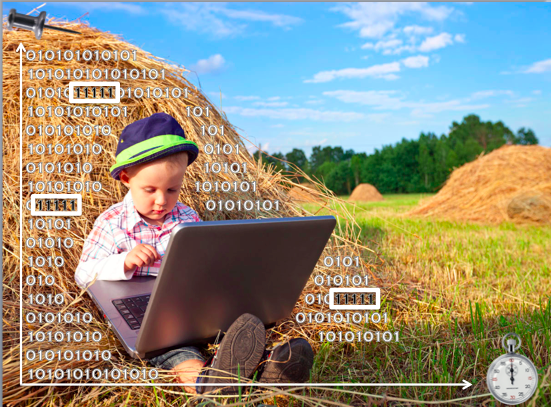 Advanced Computing uses Human and Machine Computing to manage Big Data and reduce filter failure, thus allowing humanitarian organizations to process a larger volume, velocity and variety of crisis information in less time. In other words, Advanced Computing helps us push the dotted green line up the information stack. In the early days of digital humanitarian response, we used crowdsourcing to search through the haystack of user-generated content posted during disasters. Note that said content can also include text messages (SMS), like in Haiti. Crowd-sourcing crisis information is not as much fun as the picture below would suggest, however. 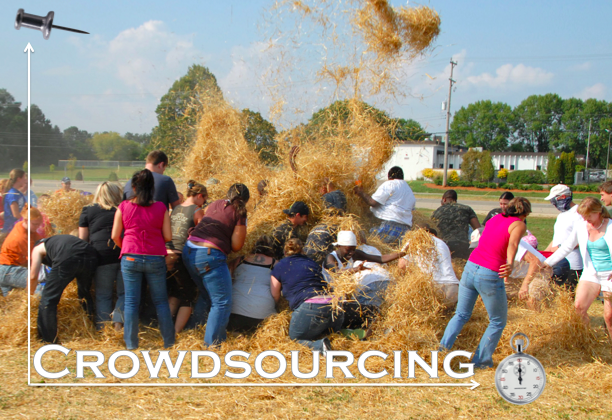 In fact, crowdsourcing crisis information was (and can still be) quite a mess and a big pain in the haystack. Needless to say, crowdsourcing is not the best filter to make sense of Big Crisis Data. 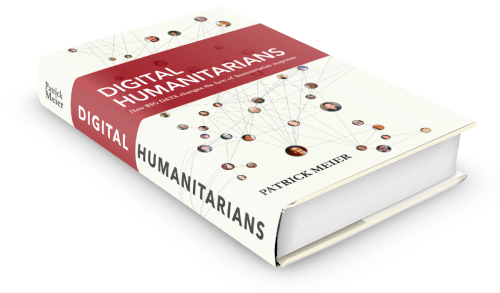 Recently, digital humanitarians have turned to microtasking crisis information as described here and here. The UK Guardian and Wired have also written about this novel shift from crowdsourcing to microtasking. 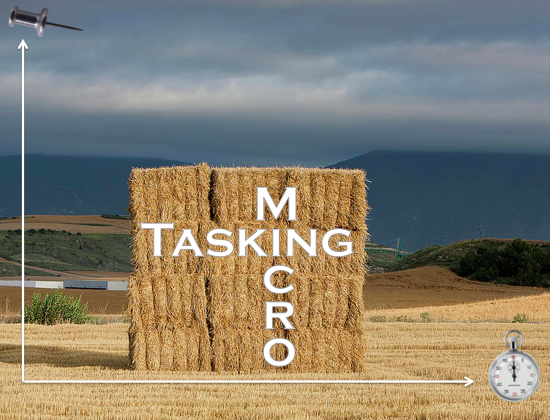 Microtasking basically turns a haystack into little blocks of stacks. Each micro-stack is then processed by one ore more digital humanitarian volunteers. Unlike crowdsourcing, a microtasking approach to filtering crisis information is highly scalable, which is why we recently launched MicroMappers. The smaller the micro-stack, the easier the tasks and the faster that they can be carried out by a greater number of volunteers. For example, instead of having 10 people classify 10,000 tweets based on the Cluster System, microtasking makes it very easy for 1,000 people to classify 10 tweets each. The former would take hours while the latter mere minutes. In response to the recent earthquake in Pakistan, some 100 volunteers used MicroMappers to classify 30,000+ tweets in about 30 hours, for example. 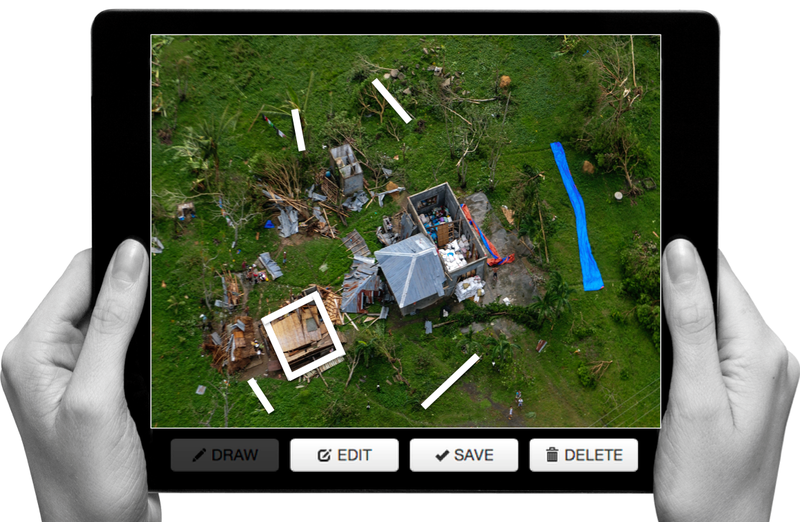 Machine Computing, in contrast, uses natural language processing (NLP) and machine learning (ML) to “quantify” the haystack of user-generated content posted on social media during disasters. 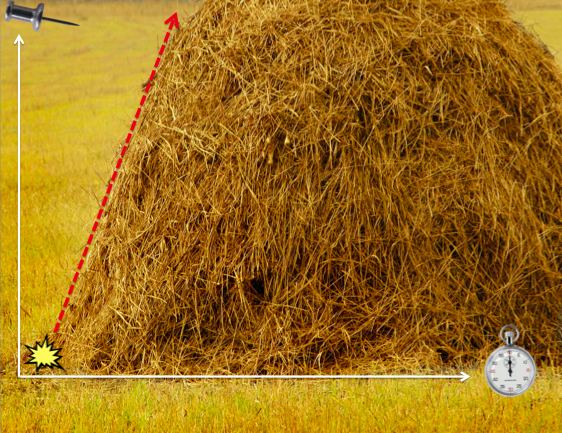 This enable us to automatically identify relevant “needles” of information. An example of a Machine Learning approach to crisis computing is the Artificial Intelligence for Disaster Response (AIDR) platform. Using AIDR, users can teach the platform to automatically identify relevant information from Twitter during disasters. For example, AIDR can be used to automatically identify individual tweets that relay urgent needs from a haystack of millions of tweets. The pictures above are taken from the slide deck I put together for a keynote address I recently gave at the Canadian Ministry of Foreign Affairs. My colleague Andrea Tapia and her team at PennState University have developed an interesting iPhone application designed to support humanitarian response. This application is part of their EMERSE project: Enhanced Messaging for the Emergency Response Sector. The other components of EMERSE include a Twitter crawler, automatic classification and machine learning. The rationale for this important, applied research? “Social media used around crises involves self-organizing behavior that can produce accurate results, often in advance of official communications. This allows affected population to send tweets or text messages, and hence, make them heard. The ability to classify tweets and text messages automatically, together with the ability to deliver the relevant information to the appropriate personnel are essential for enabling the personnel to timely and efficiently work to address the most urgent needs, and to understand the emergency situation better” (Caragea et al., 2011). The iPhone application developed by PennState is designed to help humanitarian professionals collect information during a crisis. “In case of no service or Internet access, the application rolls over to local storage until access is available. However, the GPS still works via satellite and is able to geo-locate data being recorded.” The Twitter crawler component captures tweets referring to specific keywords “within a seven-day period as well as tweets that have been posted by specific users. Each API call returns at most 1000 tweets and auxiliary metadata […].” The machine translation component uses Google Language API. The more challenging aspect of EMERSE, however, is the automatic classification component. So the team made use of the Ushahidi Haiti data, which includes some 3,500 reports about half of which came from text messages. Each of these reports were tagged according to a specific (but not mutually exclusive category), e.g., Medical Emergency, Collapsed Structure, Shelter Needed, etc. The team at PennState experimented with various techniques from (NLP) and Machine Learning (ML) to automatically classify the Ushahidi Haiti data according to these pre-existing categories. The results demonstrate that “Feature Extraction” significantly outperforms other methods while Support Vector Machine (SVM) classifiers vary significantly depending on the category being coded. I wonder whether their approach is more or less effective than this one developed by the University of Colorado at Boulder. In any event, PennState’s applied research was presented at the ISCRAM 2011 conference and the findings are written up in this paper (PDF): “Classifying Text Messages for the Haiti Earthquake.” The co-authors: Cornelia Caragea, Nathan McNeese, Anuj Jaiswal, Greg Traylor, Hyun-Woo Kim, Prasenjit Mitra, Dinghao Wu, Andrea H. Tapia, Lee Giles, Bernard J. Jansen, John Yen. In conclusion, the team at PennState argue that the EMERSE system offers four important benefits not provided by Ushahidi. In terms of future research, the team may explore other types of abstraction based on semantically related words, and may also “design an emergency response ontology […].” So I recently got in touch with Andrea to get an update on this since their ISCRAM paper was published 14 months ago. I’ll be sure to share any update if this information can be made public. Crisis Tweets: Natural Language Processing to the Rescue? My colleagues at the University of Colorado, Boulder, have been doing some very interesting applied research on automatically extracting “situational awareness” from tweets generated during crises. As is increasingly recognized by many in the humanitarian space, Twitter can at times be an important source of relevant information. The challenge is to make sense of a potentially massive number of crisis tweets in near real-time to turn this information into situational awareness. Using Natural Language Processing (NLP) and Machine Learning (ML), Colorado colleagues have developed a “suite of classifiers to differentiate tweets across several dimensions: subjectivity, personal or impersonal style, and linguistic register (formal or informal style).” They suggest that tweets contributing to situational awareness are likely to be “written in a style that is objective, impersonal, and formal; therefore, the identification of subjectivity, personal style and formal register could provide useful features for extracting tweets that contain tactical information.” To explore this hypothesis, they studied the follow four crisis events: the North American Red River floods of 2009 and 2010, the 2009 Oklahoma grassfires, and the 2010 Haiti earthquake. The paper, entitled: “Natural Language Processing to the Rescue? Extracting ‘Situational Awareness’ Tweets During Mass Emergency,” details the findings above and is available here. The study was authored by Sudha Verma, Sarah Vieweg, William J. Corvey, Leysia Palen, James H. Martin, Martha Palmer, Aaron Schram and Kenneth M. Anderson.